Silicone is not an invention of the last moment, it has entered our homes with hundreds of kitchen and bath objects and accessories to make our lives easier. Thanks to all its properties silicone is a material that can be used in many ways. It offers all the solutions for cooking savory and sweet food, substituting the conventional cookware used so far. The use of silicone went from commercial kitchens, pharmaceutical processing, and meat-packing plants into residential kitchens. FDA grade silicone has been used in applications where food is present, it is guaranteed against toxicity and completely without odors. Silicone cookware being lightweight and easy to manage are an ideal solutions for people with arthritis to the hands. 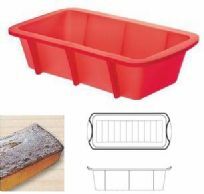 We can use silicone baking pans to make cookies, or bake a cake, to cook fish or roasts, we don’t need to use wax oven paper any more, nor butter or oils as non-stick techniques, thus eliminating some calories from our diet. Silicone cookware are flexible and bendable making the extraction of cooked food an easy process along with saving storage space without ever loosing its shapes. They are good to use up to 3000 times of cooking. As a designer, I am supposed to report on new products. Silicone cookware is original, functional and very colorful, making the art of cooking a game even for kids. I am open to all new products and new opportunities, but I must be sincere about my own ways. My kitchen is well supplied with the best chef cookware. The pleasure of my cooking is not only about the good aroma and good food I can cook, but is also about operating with the professional cookware and cutlery I possess. I don’t make it do, I have every possible solution in cookware for every speciality I prepare. Cooking for me is a serious matter and it requires professional equipment, but it is also a pleasurable game. 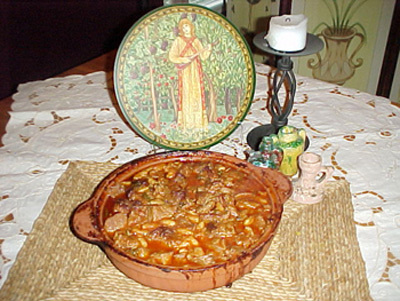 A lamb stew with beans in a clay pot as in my photo (right) could not taste right if it was made in an aluminum pan. Each food need it own vessel. Valentina Cirasola is an Italian Interior Designer with a passion for kitchens and cooking. She operates in the USA and Europe. She loves to remodel homes and loves to turn ugly spaces into castles, but especially loves to design kitchens and wine grottos.